Shattuck Avenue, downtown Berkeley’s main north-south street, carries very high volumes of auto traffic, AC Transit buses, UC Berkeley shuttles, BART commuters, pedestrians, and bicyclists. While mostly a two-way multiple-lane roadway, Shattuck Avenue splits into a couplet of two oneway segments for two blocks between Center Street and University Avenue. The high volumes and awkward street design contribute to the Shattuck Avenue/University Avenue intersection having the highest number of auto/pedestrian collisions in the City. To improve safety for vehicles, bicycles and pedestrians at all five intersections in the project area, the Shattuck Reconfiguration project will convert the three-block segment of western/southbound Shattuck Avenue into a two-way street, and the eastern/northbound segment into a minor street for local traffic. 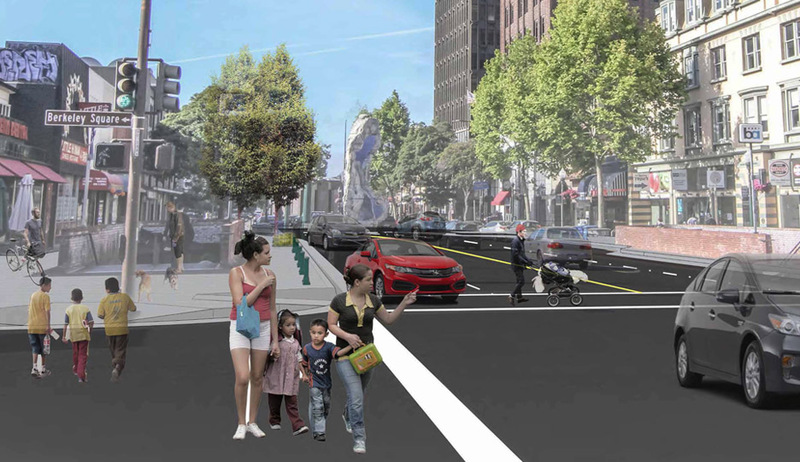 The initial project design was based on Complete Street principles, including streetscape improvements, corner bulbouts, diagonal parking, and improved connection to the BART Plaza. CHS Consulting Group is responsible for traffic signals and interconnects for five intersections: University/Shattuck (East); University/Shattuck (West); Addison/Shattuck (East); Addison/Shattuck (West); and Center/Shattuck. To minimize costs and construction impacts, CHS the design capitalizes on existing equipment, with pedestrian actuation and emergency vehicle preemption. CHS has submitted final design documents, and the project will begin construction in Spring 2018.